All Four Great Piano Concerti noted in the music history at one night! 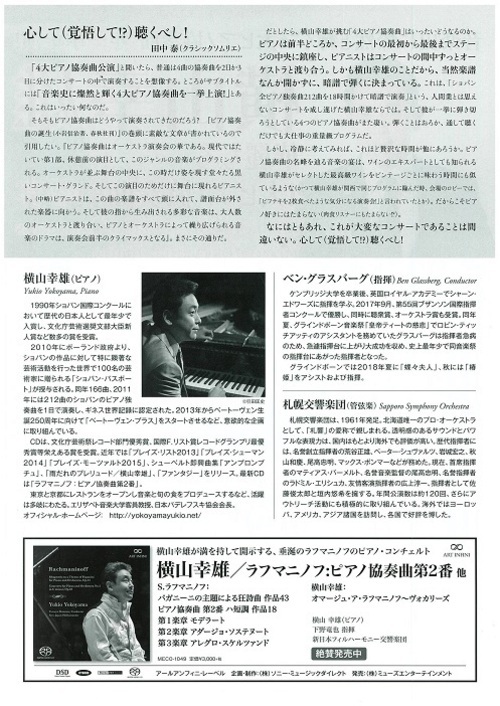 In 1990, Yukio Yokoyama won the third prize (no first prize allocated) of the Chopin International Piano Competition as the youngest ever Japanese, as well as the award from the Agency of Culture, Japan. In 2010, he was awarded “Chopin Passport” from the government of Poland, the prize presented to 100 artists who carried out notable activities related to Chopin. During the same year, he performed 166 works of Chopin piano solo, and also in 2011, 212 works, both in one day, and his performance was recognized by the Guinness Book of World Record. Since 2013, he has started “Beethoven Plus” project toward the Beethoven’s 250th anniversary. Yokoyama’s activity is not only limited to music but varied. 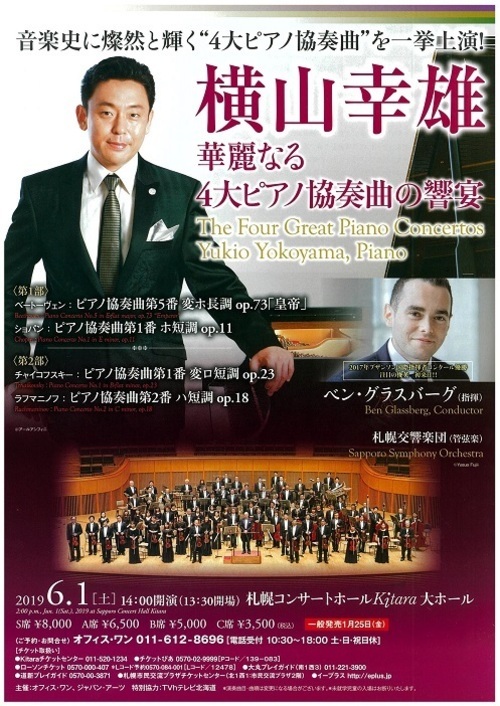 He has opened his restaurants in Tokyo and Kyoto, and is the guest professor of the Elizabeth University of Music and is the Chairman of Japan Paderewski Association. Ben Glassberg, winner of the Grand Prix at the 55th Besançon Competition 2017, studied conducting with Sian Edwards at the Royal Academy of Music, following the completion of his music degree at the University of Cambridge. A regular at Glyndebourne Festival Opera, Ben conducted a performance of La Clemenza di Tito in summer 2017, making him one of the youngest conductors to debut at the festival in its history. Ben also returned in summer 2018 to conduct performances of Madama Butterfly and in the autumn of 2018 to conduct La Traviata: Behind the Curtain. From the start of the 2019-20 Season, Ben will become the Principal Conductor of the Glyndebourne Tour, beginning his tenure with a production of L’Elisir d’Amore. Recent highlights include debut appearances with Orchestre National de Lyon, Orchestre Chambre de Paris, Royal Philharmonic Orchestra and performances of Die Zauberflote at La Monnaie. 2019 sees a new production of Hansel and Gretel for English National Opera and Ben’s debut at the Salzburg Festival, alongside symphonic debuts with the Orchestre Philharmonique de Radio France, Detroit Symphony Orchestra, St. Petersburg Symphony Orchestra and Musikalische Akademie Mannheim. Together with the National Youth Orchestra of Scotland, Ben has premiered the new work of Vikki Stone, Concerto for Comedian and Orchestra, which he conducted at Glastonbury, Latitude and the Edinburgh Festivals. *Preschoolers cannot enter the concert.